If you are looking for guides or outlines that will help you create a good external audit report, you have come to the right place. This article is filled with multiple examples of report templates that can be used to showcase the results of an audit activity. More specifically, we focus on the creation of external audit reports using pre-made printable templates. Starting off this article are downloadable external audit templates that any auditor may use to base his or her audit report template on. Also, take note that most of these printable files are available as PDF templates so make sure that you have a compatible software tool like Adobe Acrobat Reader installed on your computer before downloading a template of your choice. 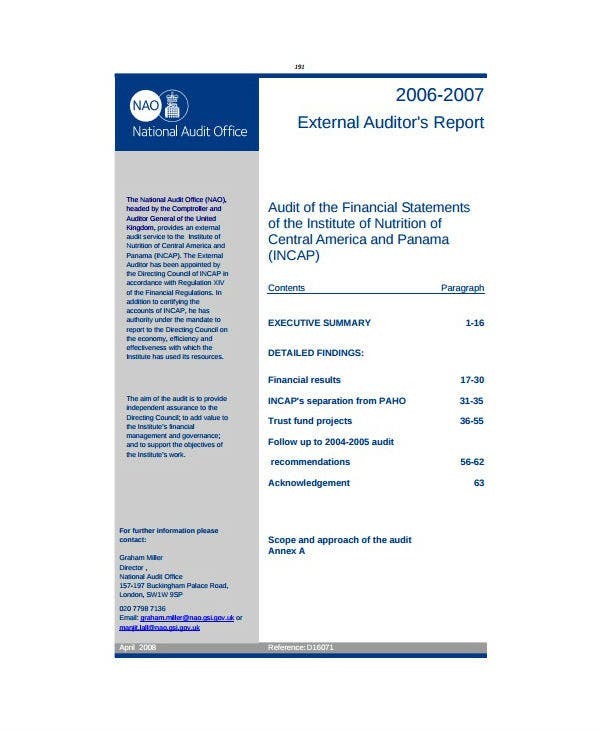 What is an External Audit Report? An audit is a process of investigating an organization’s processes, policies, or procedures with the aim of identifying any potential issues and to provide solutions to these issues. In a way, audit reports can also be called analysis reports. The type of audit that will be performed will largely depend on the kind of organization being audited and the specific department or function of the institution that will be audited. For example, if you are conducting an audit to review the different ways that consumer data is obtained and used within your business, you would most likely need to do a data audit and then create a data audit report. In this article, we specifically focus on the creation of external audit reports. This kind of audit activity refers to audit processes that are done by an external or third-party auditing firm. Different kinds of audit activities can be called external audits if they are conducted by these third-party auditing firms. External audits are usually preferred if a company wants to ensure that the audit results or findings are not biased or does not lean towards the interests of a specific department or individual within the organization. You may also check internal audit reports. The creation of external audit reports is made easier by using any of the different audit report templates that we have included in this article. Browse through these templates and choose the one that you think will best fit the kind of external audit process you wish to perform. Audit reports are important documents that accounting firms need to create after each audit activity they undertake. They are usually written by analysing all the information gathered during the audit process. To help auditors create effective reports for their external audits, we have listed a few tips that they can follow below. Read each tip carefully so that you can internalize and apply them in your audit report writing process. 1. Follow a report format or structure. If you are an auditor, report writing can easily become a grueling task if you do not set a personal process or routine before creating such a report. One way to do this is by following a report format or framework. Most account firms and organizations will have their own standard report formats while others can create a reporting framework that works best for them. 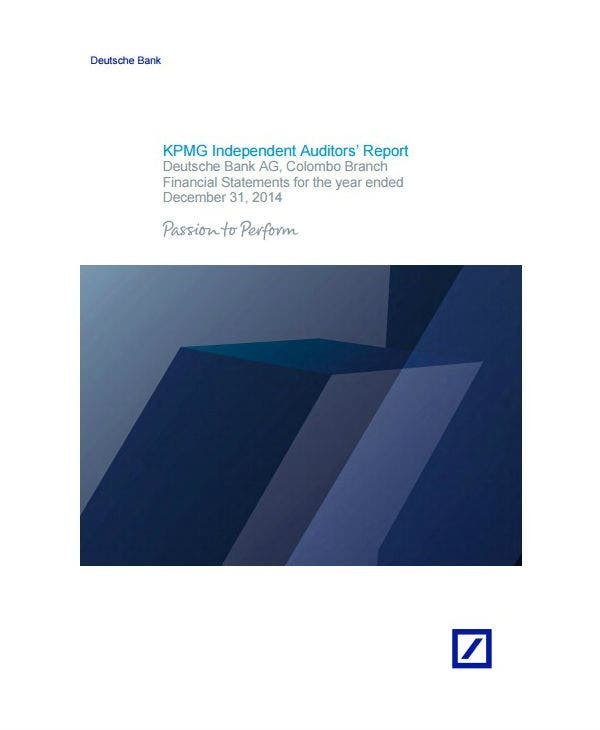 You may also see sample internal audit reports. An example of a report format includes an introduction, methodology, results or findings, appraisal reports, recommendations, a call to action, and a list of sources. Different kinds of audit activities may require a different report formatting style but the items listed above are the most common items that will be found in an audit report. You may follow any of the pre-made report formats used in any of the free external audit report templates found in this article. You may also see safety audit report templates. 2. Organize data using visualization tools. Another useful tip when writing an external audit report (or any kind of audit report for that matter) is the use of data visualization tools. Remember that most audit reports will deal with the financial status of a company or organization. And one way to make sure that the readers of your report do not easily get bored reading it is through the use of data visualization tools. This means the use of graphs, charts, pictures, and even illustrations. They are especially helpful in presenting statistical or numerical data as these things can be difficult to comprehend when only written down. To make an external audit report more compelling, you may also look into the use of data analytics in your report. As we have mentioned earlier, audit reports are important official documents that organizations and companies use to comply with government rules and regulations. Also, external audits are mostly done for publicly traded companies in order to keep transparency with their shareholders. 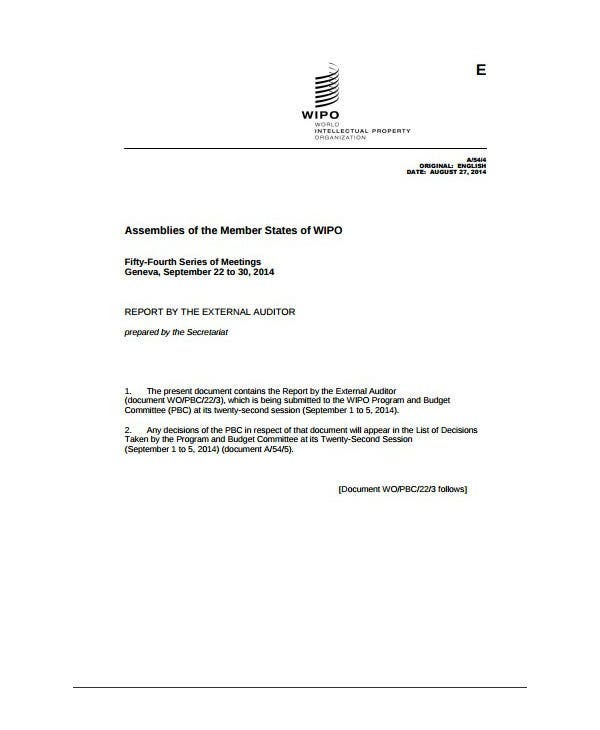 This means that any external audit report will be read by the shareholders and interested party. You may also see environmental audit reports. That is why you should make sure that you write your external audit report in the simplest manner as possible. You do not have to dumb down your report’s writing style. But, at least, you should do away with jargon and overly technical terms. 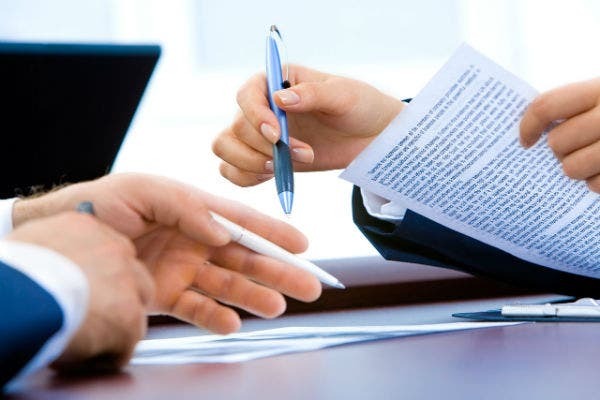 When you use concise and accurate statements in reporting a company’s financial or system status, the reader (who is usually a stakeholder of that company or organization) will understand what you are talking about and he or she will also begin to understand the reason for the specific call to actions or recommendations on the report. You may also see stock audit reports. When done well, you do not even need to verbally explain or present the results of your audit report since the written report is can already be easily understood and comprehended. You may also like forensic audit reports. 4. Make sure all findings are backed with accurate and relevant data. Another staple for any kind of audit report is the need for accuracy. Remember, an external audit report will often be considered as the basis of any legal or official actions by any concerned entity. That is why you need to make sure that your report only contains the most accurate and evidence-based data collated from your actual audit process. 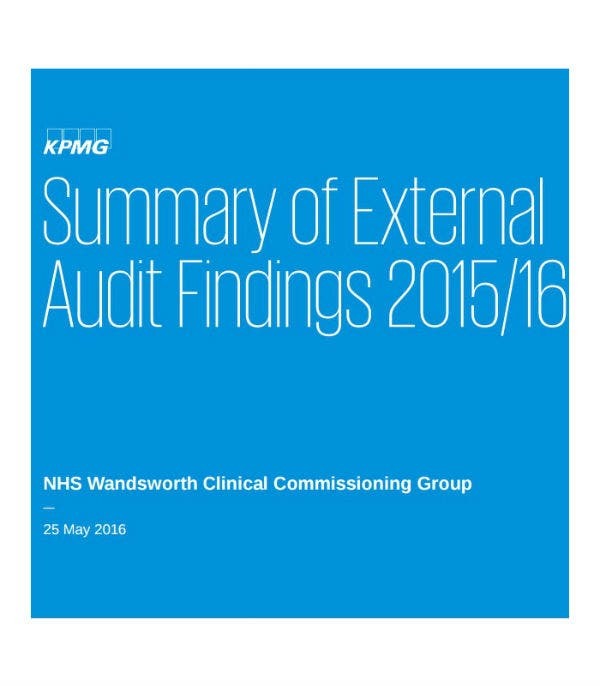 You may also see clinical audit reports. As an auditor, it is your duty to make sure that you are not biased in crafting your audit report and that you also maintain absolute integrity while doing so. You may also learn more about how to create an effective action plan. 5. Fact-check and proofread before finalizing the report. Prior to finalizing your own external audit report, you should make sure that your report is free from typographical errors, grammar lapses, and incorrect supporting data. Having all these errors will only make your report appear sloppy and ill-prepared. You may also see laboratory audit reports. That is why if you want to make sure that your audit report is as credible as it should be, make sure to have another person proof-read and fact-check it before finalizing and printing out the report. You may also see brand audit reports. 6. Offer clear and SMART recommendations. It is an essential part of any audit report to include a section for recommendations or a plan of action. Also, a good external audit report is one that includes a clear and SMART action plan. When writing the recommendations for your external audit report, you should make sure that they are specific, measurable, attainable, realistic, and that they follow a timeline. By following this set of criteria, you are guaranteed of creating an audit report that will be actionable and easy to implement. 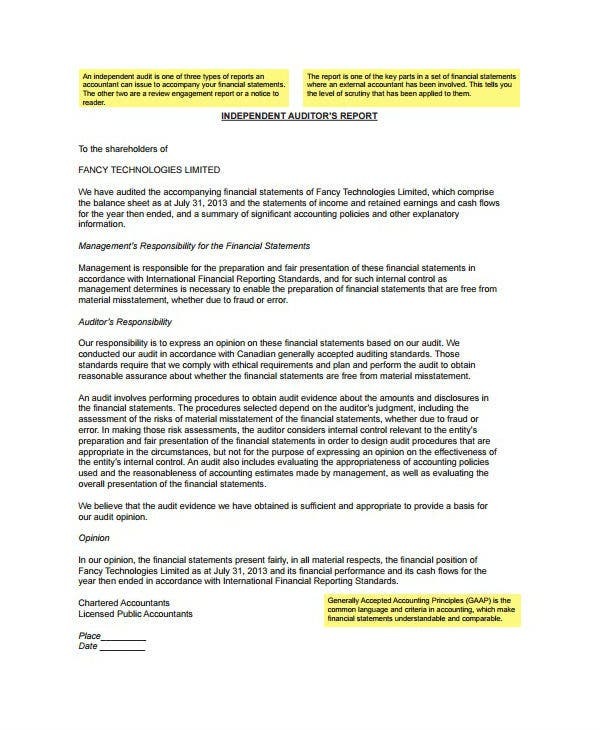 You may also see management audit report templates. 7. Use pre-made external audit report templates. Another useful tip for creating external audit report templates is the use of pre-made audit report templates. In fact, examples of these printable templates are included in this article. You may also see quality audit reports. The use of preformatted audit report templates will make it easier for you to map out the format of your own audit reports. We also know that an auditor’s job does not only involve the creation of these audit reports, Auditors and their team still needs to do the actual audits and review hundreds if not thousands of data related to the kind of audit they are conducting. 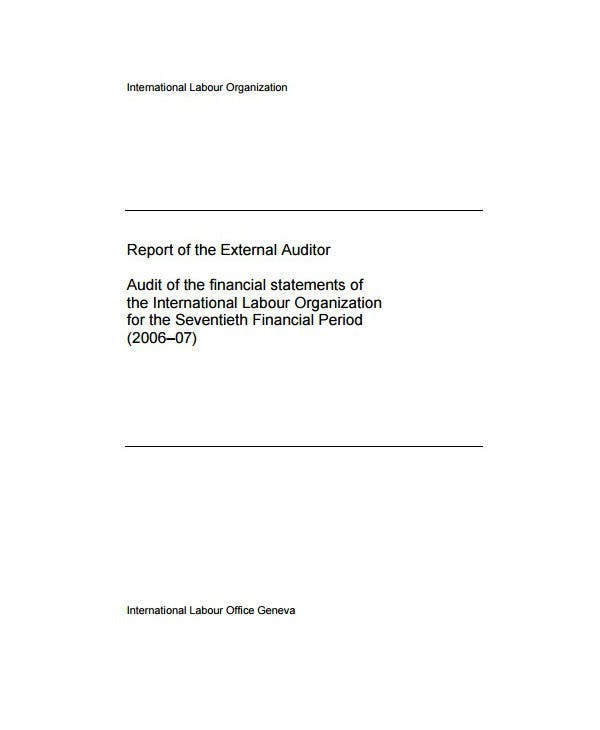 You may also see internal audit reports. The use of these pre-made report templates will only help streamline the actual audit report writing process. Use any of the different templates that we have included in this article to help your life as an editor easier. 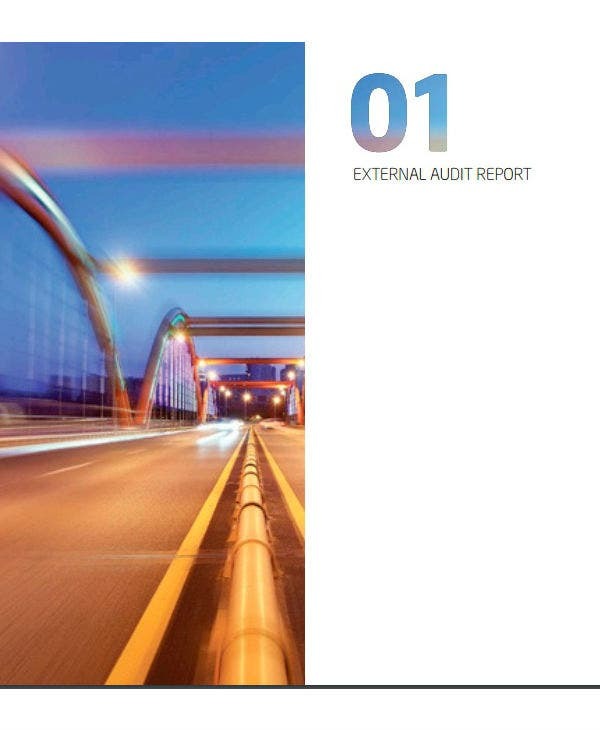 You may also see engineering audit reports. The seven tips listed above are not the only tips or guidelines that should be followed when creating an external audit report. Use your experience in auditing as a guide in finding out the best report-writing practices for you and your team. You may also see communication audit report templates. Are You Ready to Write Your External Audit Report? Always remember that any kind of external audit report will only be as good as your own auditing skills. There is no use for a well-structured audit report format if you did not gather enough accurate data for the basis of your external audit report. That is why before you write down your external audit report, you should devote all your time in making sure that all the aspects of your actual audit process will proceed according to plans. Use all the tips and free sample templates that we have shared in this article in achieving that. Do not forget to bookmark this article for future reference. You may also post this article’s link on any of your social media accounts so that your friends, colleagues, and followers will be able to use it for their own projects and audit activities.